In our house, it’s hard to walk more than a few steps without coming across a phone, a tablet, or a laptop laying on a counter or sofa, plugged in to any available outlet. I started searching for the best charging station for multiple products and was very pleased with what I found. I realized I could really use an earring jewelry box organizer. It turns out I have quite a few pairs, to put it mildly, and I was finding that I was forgetting about some of them because they would become hidden among my larger necklaces and bracelets. I began my search for the best alarm clock with dim light, and I was pleasantly surprised to find that there are great options out there to control the often overly large and bright numbers that can really get in the way of a good night’s sleep! 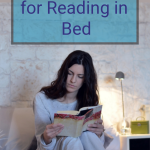 A few months ago, I began looking for the best book light for reading in bed. I was pleasantly surprised to find a variety of options, and I’m now the proud owner of several of these that I use for more than just my novel at night.